Based on the novel by Davis Grubb and adapted for the screen by film critic James Agee comes actor Charles Laughton’s sole directorial effort, The Night of the Hunter. Set in the 1930s, the mystery-drama pursues a narrative of crime and secrecy. Received as a failure both commercially and critically at the time, which many believe caused Laughton to vow never to direct again, the film is now regarded as one of the greatest American films. Robert Mitchum, who boasts over 11 awards including an Oscar nomination for Story of G.I. Joe (1945), plays Harry Powell, a twisted killer believing himself to be a man of God. The film flaunts an array of other stars, including silent film star Lillian Gish (A Birth of a Nation) and Peter Graves (who would go on to star in the Mission: Impossible television series and comedy satire Airplane!). Despite being several decades old, the film has a timeless appeal and still manages to contend with the standard of film today. The Night of the Hunter has now been re-released on Blu-ray, taken from the 2001 UCLA Film and Television restoration archive. As well as offering an enhanced viewing experience, the Blu-ray transfer also offers a few extra special features that were not previously available. The bonus material includes “Charles Laughton Directs,” a two-and-a-half-hour documentary on the making of the film, featuring outtakes and behind-the-scenes footage, an interview with cinematographer Stanley Cortez and the original theatrical trailer. The film is the story of a young boy John (Billy Chapin) and his younger sister Pearl (Sally Jane Bruce) as they struggle to conceal the location of a large sum of money that their father stole and left with them. Harry Powell, also known as Preacher, is arrested for auto theft and sentenced to a month’s imprisonment where he meets John and Pearl’s father, Ben Harper (Graves). He learns of the stolen money and persists that Ben reveals its location. When unsuccessful, Powell seeks out Ben’s wife Willa (Shelley Winters), and sets out to court her. Eventually, she is overwhelmed and falls victim to his lies and deceit. 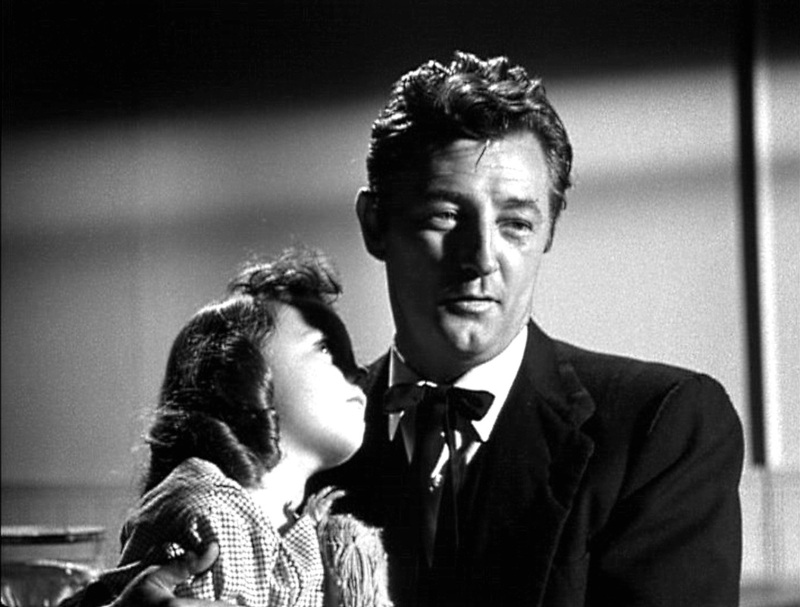 The Night of the Hunter exhibits the themes of spirituality and tradition and this is demonstrated mostly through the lighting and set design. Throughout the film, the sets resemble a German Expressionist aesthetic; locations like the river set are jagged and cardboard-like. After Willa discovers Harry harassing Pearl for the money, the bedroom appears church-like, with a sharp design and transcendent lighting adding to the spiritual atmosphere. Mitchum stands in the window, illuminated by the light as if a greater being is looking down on him. The artificial lighting and shadows are distracting in some scenes, however, such as the in the prison where Mitchum’s shadow steals attention away from the actor. However, there are moments where the shadows create tension and fright, such as when Preacher ominously appears at the Harper household for the first time. A lack of naturalism in the performances is also immediately apparent and the Blu-ray extras reveal how this overall effect came about. The child actors Chapin and Bruce appear rather dull and wooden in their portrayal of the frightened brother and sister and the extra features reveal the amount of takes Laughton needed to get the children to deliver what he was looking for, each take losing a sense of realism. The documentary “Charles Laughton Directs” begins with Laughton addressing the audience by reading an entry from the bible. Despite several failed attempts, he insists the camera continue to roll, thus revealing that Laughton was an extremely finicky director. Laughton has stated that he preferred directing theatre where he could constantly amend the production whereas film, once released, can never be changed. It is evident that Laughton struggled with his perfectionist attitude, which may be due to his experience as an actor. The special features provide an interesting insight into how Laughton dealt with the pressures of directing and they elaborate on the biblical references throughout the film. They allow the viewer to gain a greater understanding of Laughton and why he made particular directorial decisions. Where some loyal fans may prefer the washed out and over-exposed original, the re-release has no noticeable pops, cracks, scratches, flickers or audio dropouts. It is a beautifully rendered and worthwhile purchase for fans of classical cinema.